It is not easy to talk about a big yacht such as the 164' Benetti Golden Bay, especially because, due to her size and rarity, she is included in the category of "almost impossible" and extremely beautiful yachts. Stylistic standards and design tradition distinguish yachts from one another. In addition, they are divided into "classes" according to size and this debunks the general term "megayacht" which, in my opinion, is often inadequately used by the American press. In general, vessels with a length of no more than 100 feet are built by shipyards using the same criteria and design standards, yet in larger size, used for yachts of 72'/82' in length. As a matter of fact, yachts in the 91/98-foot range are often built in GRP, with a mediocre technical quality that is overshadowed by a golden appearance of extremely refined finish. Actually, the word "megayacht" should be used when vessels are in metal. 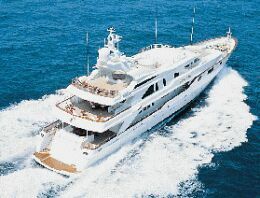 The first class of this type of yachts includes vessels of approximately 160' in length (as is the case of the Golden Bay) where the average quality is considerably higher. As a matter of fact, due to the limited number of existing vessels and to their very high price, Owners require very high construction standards, so as not to lose money. Beyond this size, the term "yacht" is lost and the vessels become small passenger ships. This name change is mostly due to the Classification Registers' limitations that impose true "shipping" solutions to increase the safety level. 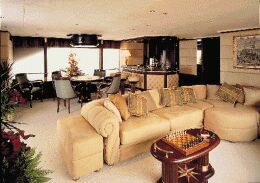 The Golden Bay is a "megayacht" of the 160' class. Her semi- planing hull may be taken from the displacement speed to the semi- planing speed at 18 knots with a ratio V/vL = approx. 1.4 (V = speed, L = LWL). One of the most controversial aspects of yachts of this type is the outside line, which depends on the vessel's functional aspects, and Golden Bay is no exception. Her line is typically Mediterranean, with a relatively low bow as compared to the North American and North European hulls, which are "formally" destined to sail in harsher sea conditions, with higher and wider bows. Actually, most of these yachts sail between the Caribbean and Saint Tropez (Cote d'Azur, France) and cross the ocean with nice weather. Captains hardly like to sail in bad sea conditions, the less the Owners and their fearful wives. I do not like how the bulwark of the Golden Bay lowers in two points. Generally, the bulwark is raised in the section dedicated to the Owner's cabin because it benefits from the full beam of the vessel, yet, by raising the bulwark twice, the relatively low bow is highlighted and the "powerful" line of the hull is interrupted. The outer aspect of this vessel seems to want to hide the "seaworthiness" of the hull with a series of slightly confusing stylistic elements. Rectangular windows at deck level and the "automobile-like" rounded deckhouse on the higher deck with contrasting rectangular windows are an example. In addition, very slanted (and badly connected) deck supports and the aggressive rounded arch give the impression of high speed, yet, the yacht cruises at only 14 knots and not at 35! The Plexiglas that surrounds the aft part of the flybridge does not improve the quality of this yacht, which, in reality, should be so elegant as to flaunt the Italian style to the world. Interiors compensate for the outside line. 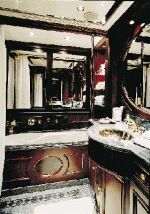 Interiors are in mahogany and combine the adequate touch of "serious seamanship", that a vessel of this type must have, with very refined and plush details such as marble work in the foyer or in the bathrooms that highlight luxury and reveal the high level of craftsmanship. The interior layout is very classical. On the main deck, the salon includes a very formal dining area; on the upper deck there is a smaller salon and a beautiful studio with library that may be converted into an emergency cabin. This studio, with a spectacular view of the water, offers some peace to the Owner away from intrusive guests, noisy children, his wife or the crewmembers who, on board this boat, seem to appear at the right time to offer you a drink.